As I wrote in my last post, I have lots of tomatoes ripening in various stages. 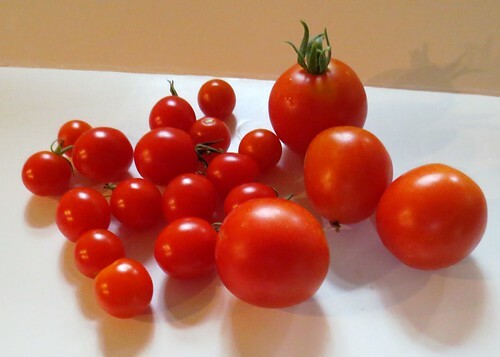 I thought it might be fun to post a photo of the different stages of my ripening tomatoes. As you can see, I have very green tomatoes, to yellow, to orange, and finally to red. 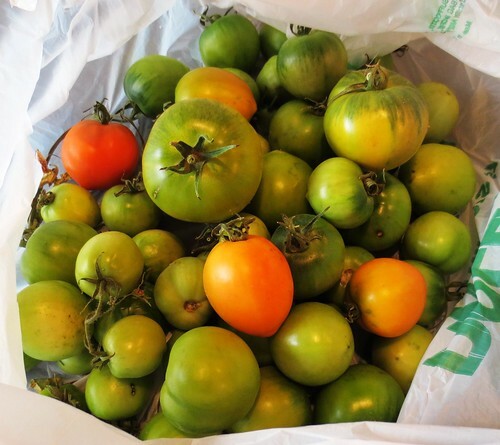 Here is my ripening green tomatoes post with some helpful tips on ripening any leftover tomatoes you may have from this year’s garden. Many of my stored green tomatoes have ripened. We will be enjoying homegrown tomatoes well into November from my stockpile of green stored tomatoes. As my gardening season comes to an end, I still have many green tomatoes on my plants. Here is just a small bag of green tomatoes I harvested off of two plants. I needed to harvest the tomatoes on these plants as they were in frost danger. You can always cover your tomato plants at night to protect them from frost but the end of my warm season is here and it was time to just pick the green tomatoes. I wrote a post a few years ago with a great tip on ripening green tomatoes. You can read that post here. If you don’t have a ripe banana to place inside your brown paper bag, don’t worry. The green tomatoes will ripen over time inside a closed brown paper bag. You can also wrap the green tomatoes in newspaper and then place them inside the paper bag. This is another good way to ripen green tomatoes and store them for future use. You can read more about storing green tomatoes here. If nothing else, place the green tomatoes on a sunny, inside window ledge and they will also ripen over time. But if you have lots of green tomatoes, you might try my useful idea about storage of the tomatoes. It is very nice to have red home-grown tomatoes into November from the brown bag storage idea. Just wanted to share a photo of my tomatoes that I harvested today. 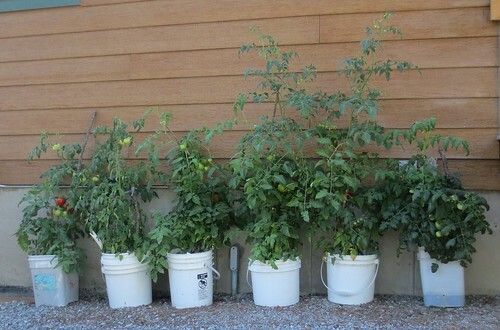 I have several containers of tomatoes growing this year. The tomatoes are starting to ripen and here is today’s little bounty. These homegrown tomatoes have just the best taste. Not like some of the plastic-tasting tomatoes you buy in the store. Anyway, we are just loving our tomatoes and still have more green ones on the vines that hopefully will ripen soon. This weekend I harvested my indoor basil that I have been growing over the winter. I brought my plants indoors last fall and while they don’t grow all that great inside in the winter, they do produce. 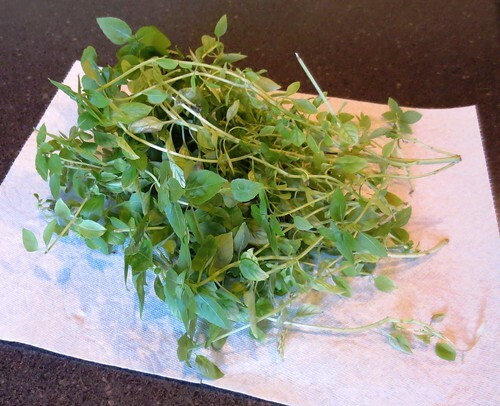 Here is my harvested basil I cut off the two plants I had over the winter. I left some base in the pots so they can regrow again this spring once it warms up. I am now drying these leaves and hope to have a bounty of fresh dried basil to use over the next few months. I should add that I have been cutting off leaves from these plants throughout the winter. I have used the fresh leaves in spaghetti, pizza sauce, and lasagna recipes over the last several winter months. It is always wonderful to use fresh cut-up basil in my cooking. Wild Lupine is blooming right now in the woods around us. It is just so beautiful and I love the smell. 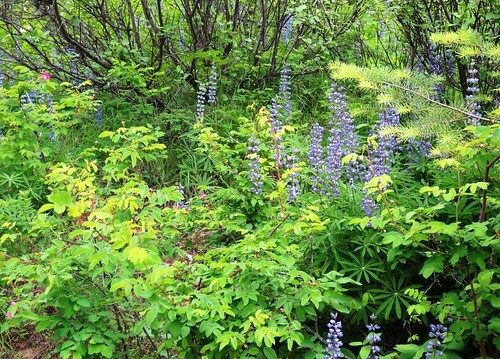 We are lucky enough that the blue Lupine grows wild and comes back each year. The official name according to Wkikipedia is Lupinus. The flowering plant is in the legume family of Fabaceae. The seeds in various forms have been around for thousands of years.